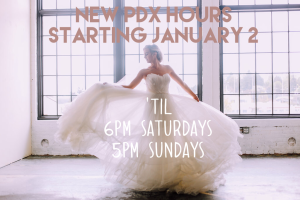 Portland boutique permanent extended hours! We are extending the hours at our Portland boutique! Because we do not take appointments, we hope to better accommodate brides and their bridal parties by increasing the hours we are open!